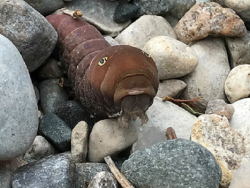 Thousands of pest photos submitted for identification. 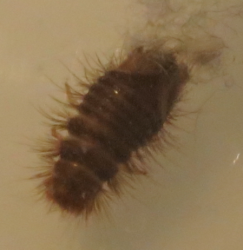 Number 6346 This is a larva of a carpet beetle (Coleoptera: Dermestidae); it appears to be in the genus Attagenus (black carpet beetles and allies). Click here or elsewhere on this site for some control recommendations. Number 6345 These are amphipods, crustaceans also known as scuds or sideswimmers. Most species are aquatic, but a few (such as yours) may be found on very damp/wet soil or other surfaces. These species sometimes are referred to as ‘lawn shrimp’ and are harmless; Click here for more detailed information. 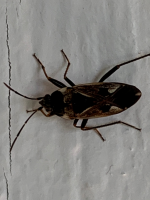 Number 6344 This is a tuxedo bug, Raglius alboacuminatus (Hemiptera/Heteroptera: Rhyparochromidae); a Eurasian species that appears to have been introduced into North America about 20 years ago. 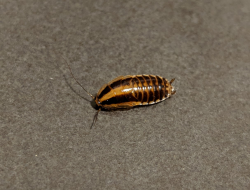 These are nuisance pests that do not appear to cause any real harm. Click here for more detailed information. 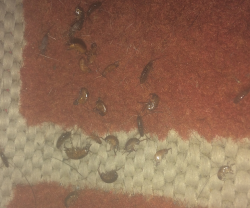 Number 6343 These are sowbugs, terrestrial crustaceans in the order Isopoda. 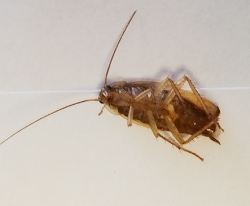 These basically are harmless scavengers on decomposing organic matter, but they sometimes become nuisance pests when large numbers occur indoors. They breathe through gills that must be kept moist, so moisture management is the best control. 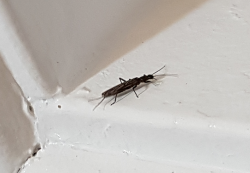 Number 6342 These are small winter stoneflies (Plecoptera: Capniidae); they are harmless and there is no need for control. Their nymphs are found beneath rocks and gravel on the bottom of streams and rivers where they feed on plant material there; the adults feed on blue-green algae. The adults most often are seen in late winter/very early spring. Number 6341 This is a larder beetle, Dermestes lardarius (Coleoptera: Dermestidae), a cosmopolitan pest species. Click here for more detailed information. Number 6340 This is Chariessa pilosa, a checkered beetle (Coleoptera: Cleridae), Click here for an image. Checkered beetles are general predators on other small arthropods; the larvae of this species are reported as feeding on larvae of wood-boring beetles. 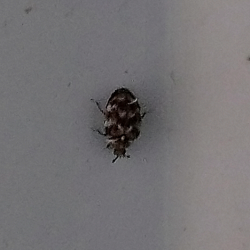 Number 6339 This is a carpet beetle (Coleoptera: Dermestidae); it looks like a varied carpet beetle, Anthrenus verbesci. The adults often are found at windows where they have been attracted by the light in their attempt to get outside. Click here elsewhere on this site for some control recommendations. 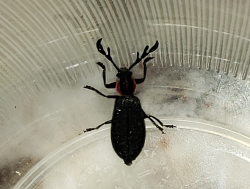 6338 Black, 6 legged beetle with orange colouring on top of back. 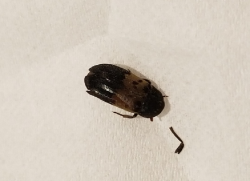 Beetle had orange belly with black dots. 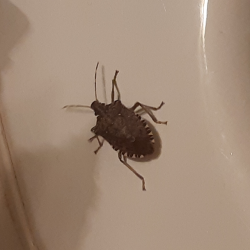 This guy was crawling up my bedroom wall as I was in bed. Fair size, I’d say about the size of my pinky nail. 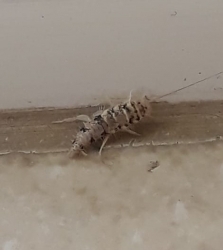 I have never seen this kind before and I am slightly concerned that there may be more, just looking for information. Thank you! From Three Hills, Alberta. 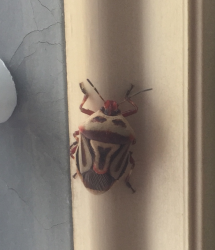 Number 6338 This is a two-spotted stink bug, Perillus bioculatus (Hemiptera/Heteroptera: Pentatomidae). This is a predatory species, and its primary prey is the Colorado potato beetle; Click here for more detailed information. It is certainly nothing to be concerned about in your home. 6337 These are tiny (approx 1-5mm) black worm-like but crawl like caterpillars. 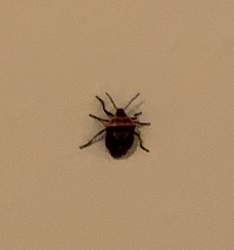 They’re inside my walls and climb up windows and walls and are spreading through the whole house wherever hasn’t been sprayed. 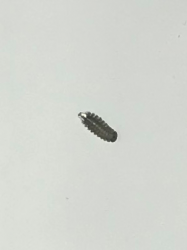 I think they’re carpet beetle larvae but they’re not in my carpets. 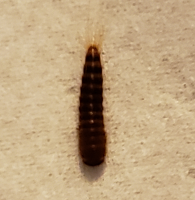 I’ve killed over 200 myself and pest control has been 3 times, I was told 99% of carpet beetle larvae don’t behave like this. This has been going on for 4 weeks and I am going crazy. 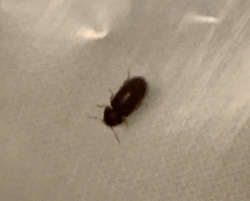 Please help confirm what these are, they look like your recently posted photo but somewhat different. Thank you. From Victoria, BC. Number 6337 These are duff millipedes (Diplopoda: Polyxenidae; Polyxenus sp. ), sometimes also called dwarf or bristly millipedes. Normally found outdoors where they feed primarily on lichens and algae, they cause no harm and do not need control. Visit Click here for more detailed information. Number 6336 This looks like a firebrat (Thermobia domestica; Zygentoma: Lepismatidae), a cosmopolitan nuisance pest. Click here for more detailed information and click here for some control suggestions. 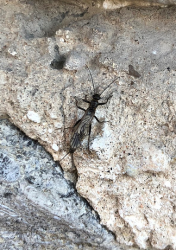 Number 6335 This is a small winter stonefly (Plecoptera: Capniidae); these are harmless and there is no need for control. Their nymphs are found beneath rocks and gravel on the bottom of streams and rivers where they feed on plant material there; the adults feed on blue-green algae. Number 6334 This looks like a drugstore beetle, Stegobium paniceum (Coleoptera: Anobiidae); Click here for an image. 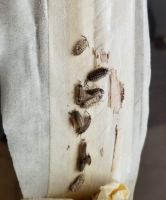 These beetles and their close relatives, cigarette beetles (Lasioderma serricorne) will feed on an extremely wide variety of organic materials, and can become pantry pests. You likely should check all your dry food storage areas for signs of insect infestation. Number 6333 This is a larva of a carpet beetle (Coleoptera: Dermestidae); likely in the genus Anthrenus (varied carpet beetle, etc.). Click here for control recommendations. 6332 This insect is from a very large nest (6′ x 3′) in a tree in Sarasota Florida. 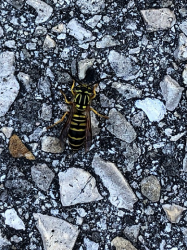 I think it may be a Paper Wasp but the photos of various wasps and hornets look a lot alike. Many thanks. From United States. Number 6332 This looks like a southern yellow jacket, Vespula squamosa (Hymenoptera: Vespidae). These usually nest underground or in cavities, but occasionally have been known to construct very large aerial nests. Click here for more detailed information. Number 6331 This is a stink bug (Hemiptera/Heteroptera: Pentatomidae), it looks like a brown marmorated stink bug (Halyomorpha halys), an introduced species that has become well-established in many areas of North America. 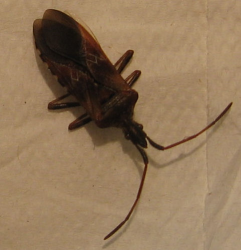 In addition to its status as an orchard pest, it also can be a nuisance pest when large numbers enter buildings for shelter. Click here for more detailed information. Number 6330 This is a cockroach, likely a German cockroach, Blattella germanica (Blaberoidea: Ectobiidae). This species is notoriously difficult bring under full control; Click here elsewhere on these pages for some control recommendations. Number 6329 This appears to be one of the grain beetles in the genus Oryzaephilus (Coleoptera: Silvanidae), either a saw-toothed or merchant grain beetle – Click here for more detailed information. Number 6327 This appears to be a nymph of a German cockroach, Blattella germanica (Blaberoidea: Ectobiidae). This species is notoriously difficult bring under full control; Click here elsewhere on these pages for some control recommendations. 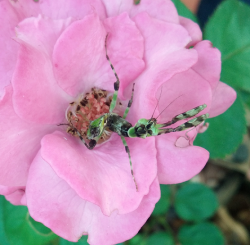 Number 6326 This is a praying mantis (order Mantodea); there are at least 162 species reported from India – Click here for details. 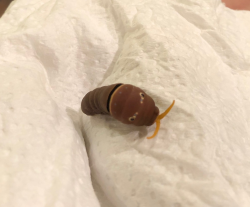 Number 6325 This is a caterpillar of a swallowtail butterfly (Lepidoptera: Papilionidae). 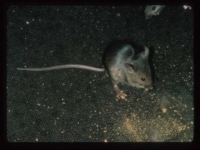 The foul odor is emitted by the fork-like appendage visible above its head. Called an osmeterium, it serves as a defensive mechanism for the caterpillar; Click here for more detailed information. Number 6324 This is a funnel weaver spider (family Agelenidae); likely in the genus Eratigena – Click here for an example. They are not dangerous to humans. 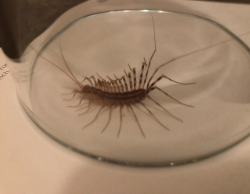 Number 6323 This is a house centipede, Scutigera coleoptrata, a cosmopolitan species that apparently originally was native to the Mediterranean region. Unlike most other centipedes, it has very good vision and can run down its prey. Click here for more detailed information. 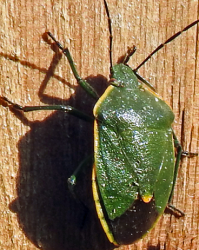 Number 6321 This is not a beetle, but a stink bug (Hemiptera/Heteroptera: Pentatomidae) in the genus Chlorochroa, Click here for an example. 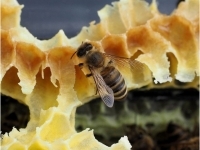 There are at least seven species in this genus native to British Columbia. 6320 I found this beetle on my deck and was shocked to see it! 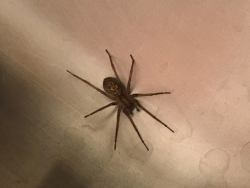 Never seen one so big around here! I looked at some pics but could not identify it! Was hoping you could. We are on an acreage south of Saskatoon SK. Thanks. From Saskatoon. 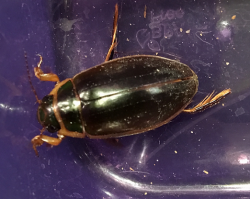 Number 6320 This is a predaceous diving beetle (Coleoptera: Dytiscidae). They and their larvae (often called water tigers) are general predators on other small aquatic life forms, mainly other insects. They also are strong flies and may be found at quite some distance from water. Number 6319 This is a house centipede, Scutigera coleoptrata. 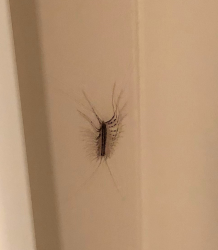 House centipedes feed on a wide variety of other arthropods, mainly insects, and their presence indoors may be an indicator of an infestation of some kind. Click here for more detailed information. Number 6318 This is a blister beetle Coleoptera: Meloidae) in the genus Meloe. 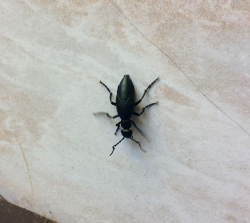 These are often called ‘oil beetles’ as they exhibit reflexive bleeding from their leg joints when disturbed. Their blood (hemolymph contains a chemical, cantharidin, that can cause blistering on tender skin. Click here for more detailed information. Number 6317 This is a larva of an Asian multi-colored lady beetle, Harmonia axyridis (Coleoptera: Coccinellidae), an introduced species having a very widespread distribution and that goes by several other common names. Click here for more detailed information. Number 6316 This is Argiope trifasciata, an orb weaver known as the banded garden spider. It occurs from southern Canada to northern Mexico; they usually are noticed in late summer/early autumn when the females reach their full size. 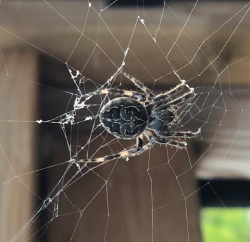 Like other orb weavers, they are harmless to humans. Click here for more detailed information. Number 6315 This appears to be a bridge orb weaver, Larinioides sclopetarius (family Araneidae); Click here for images and more information. All orb weavers are harmless to humans. Number 6314 This is a caterpillar of an eastern tiger swallowtail butterfly Papilio glaucus (Lepidoptera: Papilionidae); see Click here for detailed information. Note: Some authors split off tiger swallowtails into the genus Pterourus..